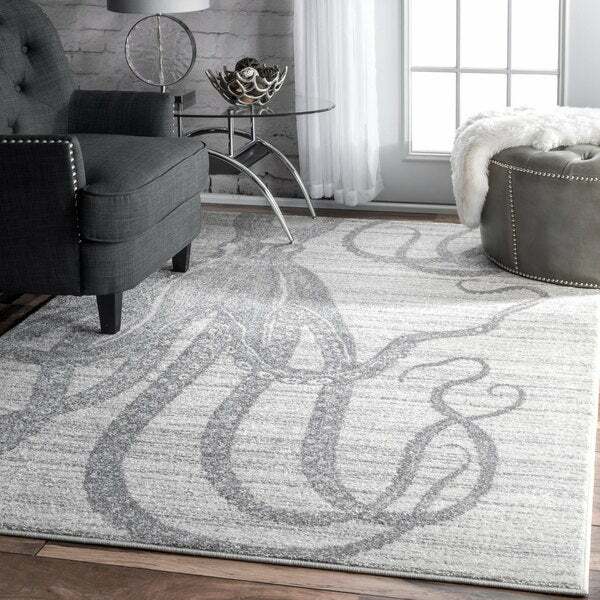 Love this rug and the way the octopus blends in with the the various grey colors in the rug. Please note it's pretty thin but it looks great and is a nice soft texture. Does not shed and is a breeze to vacuum. We use this rug under our kitchen table and absolutely LOVE it! Because it is slightly obscured by the table and our chairs (gray Tolex) you get glimpses of the octopus, but don’t see it outright unless you look down one side of the table. Our kitchen is painted gray and it looks modern and interesting. We get comments on it all the time. 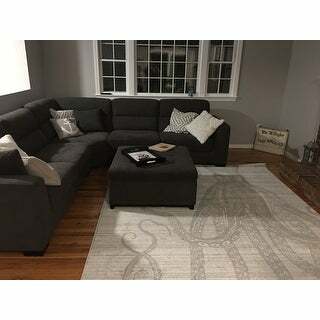 We are getting ready to move to a larger home and love this rug so much that we will probably move it to a room where you can see the design more clearly. It is soft and comfortable under foot and has not been shedding. We put a carpet pad underneath, as well. It is a strong design piece, but the contrast is subtle. Perfect! So in love with this rug! Its in my sons room who has a nautical theme. Shark and octopus prints w PB shark bedding. Everyone who sees it cant stop talking about it. Laid down nicely from the start, has a low pile, tight weave and is soft to the touch. Comfortable to walk on. The light colors blend in well. The image is suttle but none the less there making it a great rug for any area no matter how formal. The details in the octopus are very nice. Could not be more pleased. I give thus cozy, happy area rug 5 stars due to it’s softness, ease of cleaning, price and adorability. We love the octopus design. Adds charm and personality while still being neutral. Pattern has more detail up close in person. Recommend for the sea-loving! This rug is very nice. The colors are what I expected and the nap is fine. The only issue I have with the rug is that the pattern is opposite of what it looks like in the photo. I love, love!! this rug. I put it in my kitchen and it looks fantastic! Get compliments all the time. I would for sure recommend this rug! Love the octopus, something unique and different. Color goes great with furniture and wall color. Very pleased. Order & delivery, fast & painless. We LOVE!!!!! This rug! Super soft and very comfy! It looks amazing in our home. This is a great, clear and really fun pattern! It is beyond our expectations and I would absolutely recommend this to anyone! Our friends (and my very opinionated mother) also loved it!beautiful and neutral soft greys that will match almost any decor! Love this rug went great with my decor, very durable and easy to clean. Delivery was a fantastic. Highly recommend this product if you want a coastal themed rug. It is soft, beautiful, and I love it. Option: Grey - 7' 6" x 9' 6" | Silver - 7' 6" x 9' 6"
This rugs is great for a coastal bedroom. Adds interest and texture with a modern twist. I love it so much I'm buying another. I love Overstock rugs. 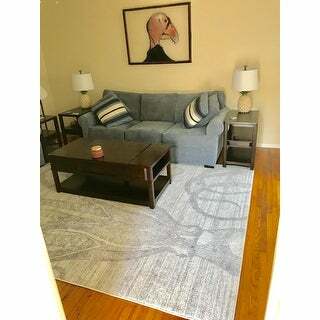 It’s such a stylish and unique rug. It goes great with all of our furniture and makes the room more cozy. It’s great quality and clearly made well. This rug is fantastic. It goes great with my glam room. My Boyfriend wanted an Octopus tattoo on his leg, we compromised for on a new rug! Thanks Overstock! Like this rug a lot. It is very clever and attractive design and feels soft on your feel. It isn't the highest pile but I didn't expect that at this price and I didn't actually want a higher pile. I thought this was excellent for the price. 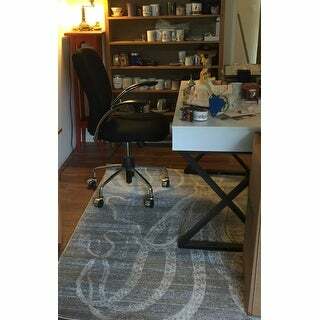 I put it on the Nourison reversible non slip pad. The only thing (why I didn't give it 5 stars) is the rug came delivered in a tube and while packing it in there, they got a big wrinkle pressed into the tube and it's made a blip in the carpet that isn't smoothing out. Quite soft. I like the texture. Received the rug today ahead of the scheduled delivery date. Really nice quality rug. Not super thick but still soft. The grey is not as dark as pictured. Still happy with the purchase though. This is a super fun rug. It looks great in my son's bedroom. Same thing, steampunk theme for decor and this will go in the living room. I'm making many things on my own but a few I'm purchasing at various locations. "Is it supposed to be delivered Nov 7th?" Yes, if the order is placed 3 business days prior to this date it should arrive on time. "Is the octopus ivory or white? Pam"
The design is a slight "off white" tone. "Would this rug be prone to snags? We have a large dog who frequently gets his claws caught in the loops of our current area rug. This results in unraveling when the rug is vacuumed. 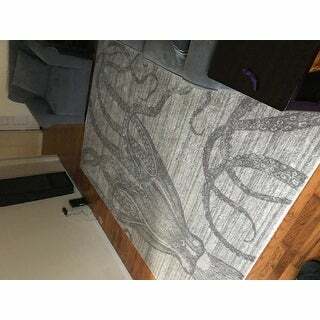 This rug looks stunning, would love to buy it if the snag issue wouldn't be present." The rug is machine made with polypropylene, it is very durable. It should be able to withstand a pet.